Ideal for joggers, commuters, and other active music listeners, the Sansa Clip Zip delivers on-the-go music at an affordable price. 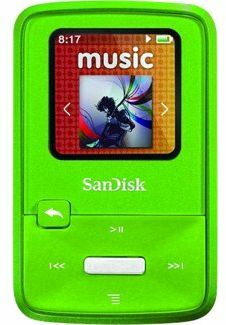 This compact MP3 player is loaded with premium features, including an integrated FM radio, built in voice recorder, stop watch, and compatibility with a wide range of digital audio formats from nearly every source including AAC for DRM-free iTunes. And thanks to an innovative clip design, the player attaches easily to your clothing, so you can take it wherever you go.1x Built-in Rechargeable Lithium-ion Battery. An FM radio is included, along with the expected array of auto-preset detection and FM radio recording.